I have just read an heroic account of a KAP shoot in a near overblown state and it occurred to me that I’ll pass on what I know about matching kite and line to wind. I realised I would need a selection of kites to lift my rig after spending hours in a field waiting for my rig to get off the floor with an under-sized kite in a light wind. I require the flight to be able to lift 1kg and fit on my bike along with the rig and ground gear. 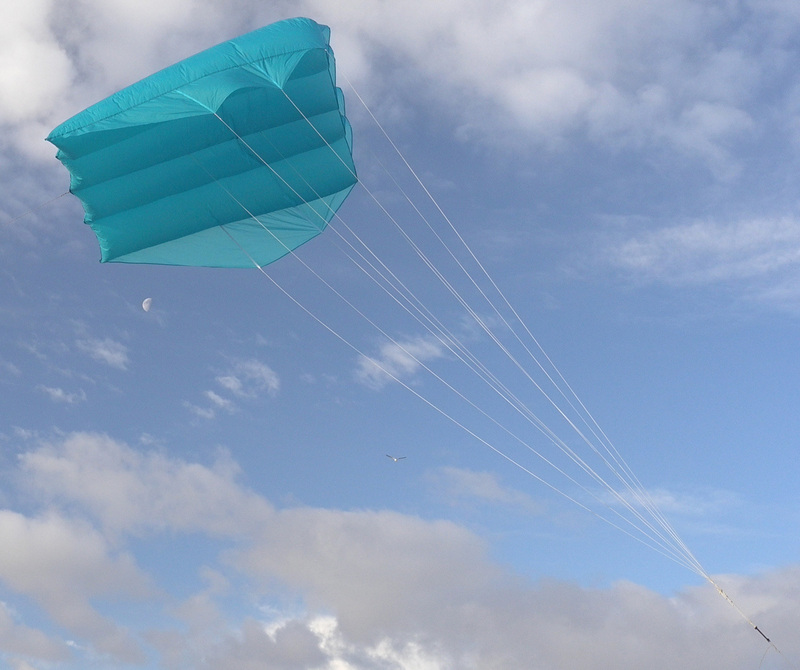 I like the pull of the loaded kite to be balanced by my body weight so that I am mobile. Flexibility: Light winds only. Flown on light weight ‘Powerline Extreme’ Coramid line to maximise lift. Stability: tends to weave a bit compared to the flowforms. Dangerous in overblown state. Must be drogued to reduce tendency to inversion. Handling: it’s a difficult kite in wind speeds above 7mph! Robustness: Shroud-lines need to packed carefully to avoid tangling. Seams will split if crashed in strong winds. Flexibility: flies across a wide wind range ( 3.5 to 16mph). Stability: good in most conditions, must be dampened with a drogue to deal with gust. 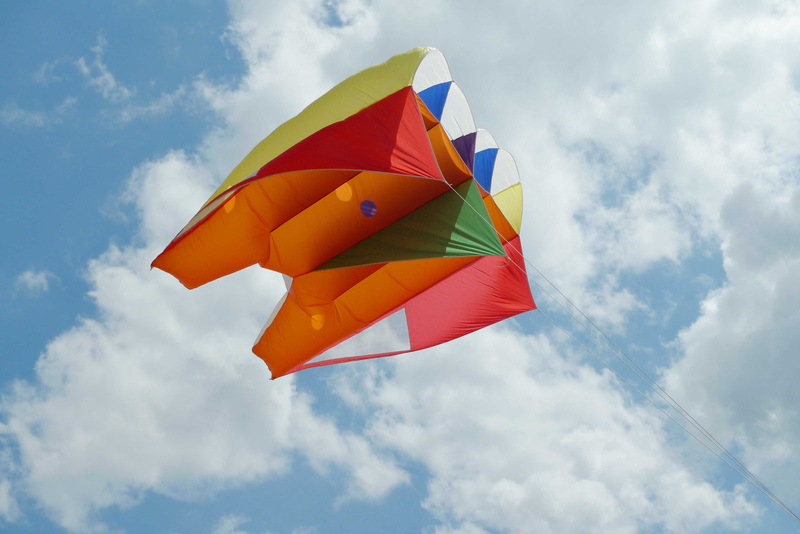 Handling: can be a pain to launch in light wind and is very susceptible to collapse and inversion in rotor and vortex effects. Robustness: very hard to break but stitching needs checking if over-flown in high wind speeds (16mph+). Flexibility : Fly in fresh winds only. Stability: Always flown with a drogue- dreadful in near ground turbulence. Handling: Copes with Beaufort 4 easily, its weight balances its pull nicely. Robustness: It’s made of heavy weight fabric so it is heavy (therefore rubbish in light winds) but robust. Flexibility: rated at 5-40 knots (6-46mph, up to Bft7!) won’t lift a rig until flown in at least 15mph. 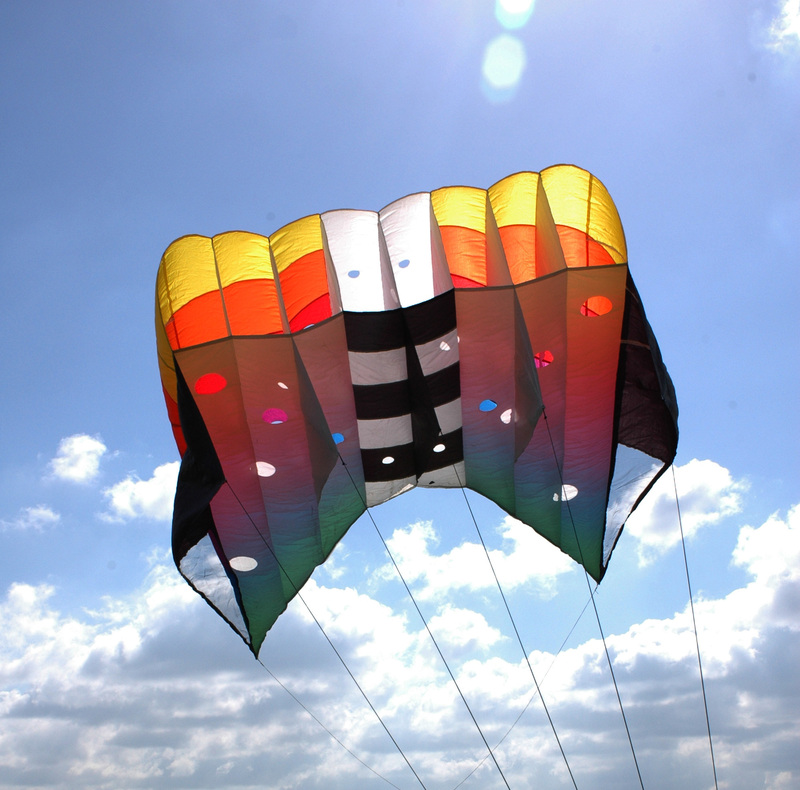 Stability: tends to dance about at launch and landing, takes high wind speeds well. Twitchy. 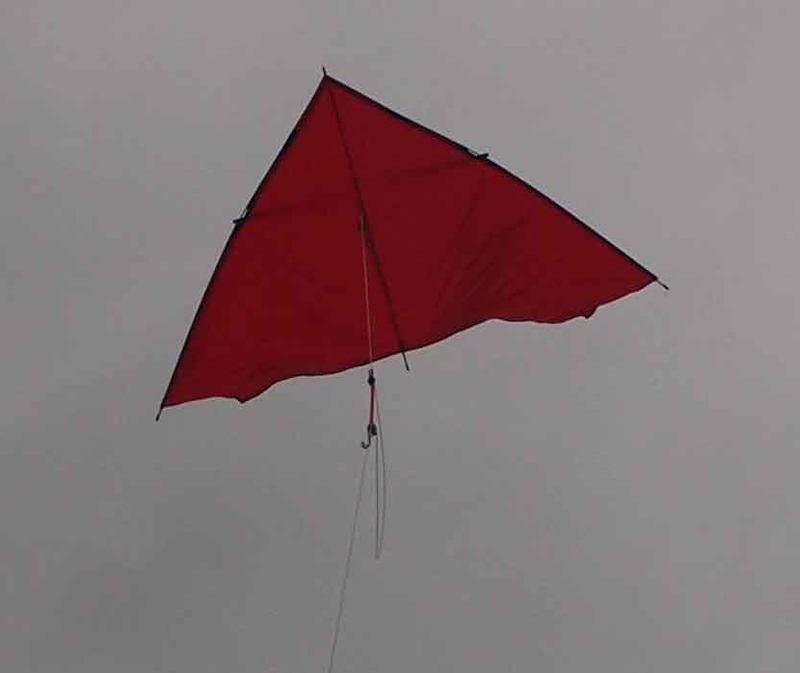 Flown with shock-cord damper below kite and above rig. Handling: typical delta- needs care on recovery, noisy! Robustness: Well made from heavy duty materials, awkward to transport. To date the PFK has developed a nasty tendency to swoop across the sky and vibrate horribly and the CiM Lifter has done one invert too many on hitting a bigger wind speed than the one it was launched in, so of the 4 kites it’s the middle 2 I get on with best! I fly with 2 x 10″ halo reels of different weights, one heavy, of braided Dacron 250lb (my favorite- it is easy on the hands for hauling in) and one, light, of Coramid ‘Extreme’ 500lb for the light wind flights (it’s nasty stuff to handle but wonderfully light). I use a cavers harness with a figure eight hitch, Jebe/Benton modded Hexaratchet and reel clip attached. For control I’m on my second ‘standard’ Futaba 4 channel RC controller (the first was destroyed by an enthusiastic dog jumping on it) with added video screen and receiver. I also always carry the essential PPE of a pair of gloves and polaroid sun glasses! The bike is pretty well loaded if I try to get the whole flight on it but, of course, I leave at home the kite(s) least likely to fly in most cases. Gallery | This entry was posted in KAP, Kites. Bookmark the permalink.